In collaboration with Sony Pictures, Activision has announced a new Ghostbusters game set after the events of the upcoming film. The top-down action title which features coop up to four players locally will hit PC, PS4 and Xbox One on July 12. SANTA MONICA, Calif. – April 15, 2016 – Activision Publishing, Inc., in collaboration with Sony Pictures Consumer Products, has announced a pair of new Ghostbusters video games set in and inspired by the comedic action world of the upcoming Ghostbusters film, in theaters July 15. Taking place after the events of the new movie, both Ghostbusters games introduce new casts of rookies keeping watch over the station while the now-famous Ghostbusters tour the country stopping high-profile poltergeists. When paranormal phenomena unleash apparitions across New York City, these new squads of recruits must don their proton packs and wrestle those rogue spirits back to the afterlife! The console game, Ghostbusters, is a third-person action role-playing game positively charged for thrilling couch co-op with up to four players locally. As rookie Ghostbusters, players can level up their characters’ gear and abilities by tackling objectives, defeating ghastly creatures and discovering hidden collectibles in Manhattan’s most haunted haunts. There are four heroes to choose from, and each has his or her own unique personality and play style, bringing special strengths to support the team. 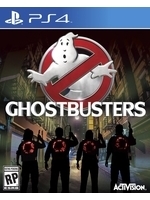 Ghostbusters is expected to arrive on the PlayStation®4 computer entertainment system, Xbox One and Windows PC via Steam on July 12. The mobile game, Ghostbusters: Slime City, lets players be a Ghostbuster and save New York City from a new wave of threats. Team up with other players in asynchronous co-op, and collect powerful ghosts to rise to the top of the leaderboards. Players can also craft their own proton packs from any number of combinations of components, as well as upgrade their own headquarters and complete jobs around the city for new weapons and rewards. Ghostbusters: Slime City is expected to launch in July on select iPhone, iPad and iPod touch devices via the App Store, select Android devices via Google Play and select Kindle devices through the Amazon Appstore. Can't be worse than the trailer for the new movie. I'm more excited for this game than I am for the new movie, but I guess that's not really saying much.